It's hard to believe that my last post was nearly one month ago. I spent as many days and nights as possible with my mom while she stayed in the hospital. I actually lost count but I think she was hospitalized for 13 days and I believe I slept in a recliner in various lounges and waiting rooms for at least 9 of those nights. Surprisingly, the chairs were very comfortable but occasionally they folded up on me while I was sleeping in them which was a little disconcerting. They were also noisy and I was afraid of waking up other exhausted people trying to catch a few winks while they waited for news about their loved ones. My mom was transferred locally and it is so much easier having her in town as she rehabs and it's wonderful to be able to crawl into my own bed at night; it makes all the difference in the world.. She is doing much better and I cannot begin to thank you all for your lovely messages, emails and prayers while she has been ill. THANK YOU ALL SO VERY MUCH! 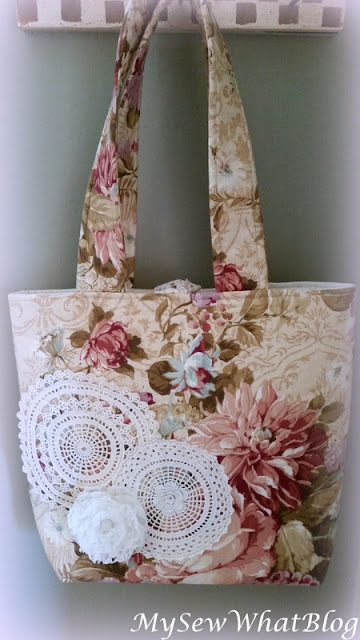 This tote bag is the only thing I have sewn in the past month. I worked on it one evening when I came home from the hospital to do laundry and pack clean clothes. 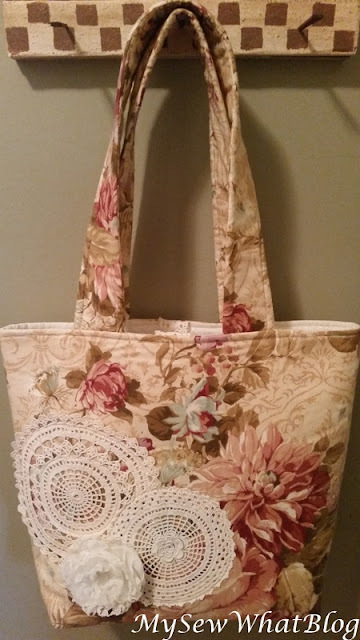 I finished it during another overnight at home. 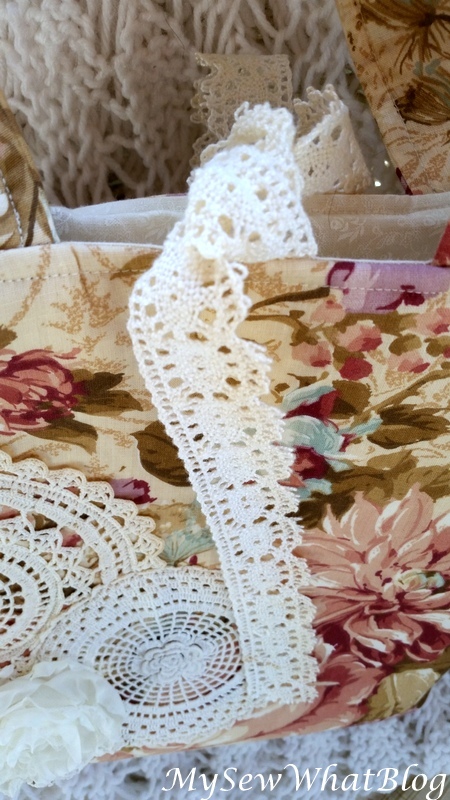 I utilized some vintage doilies and I made a flower from fabric and lace to add as an accent. A little tiny button is in the center of the flower. 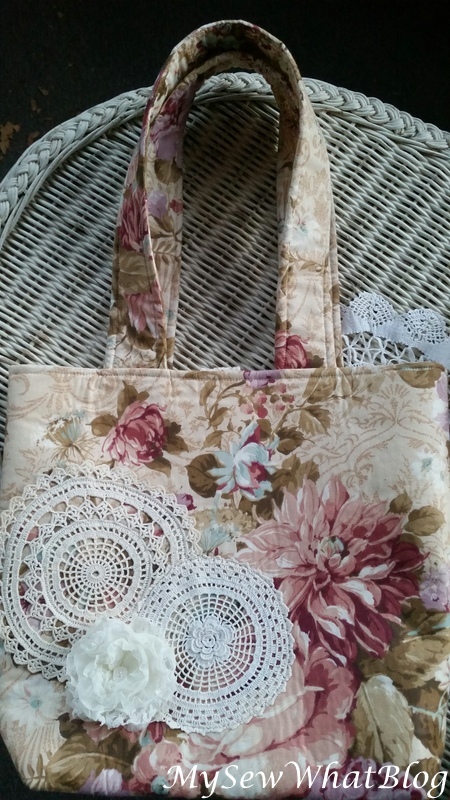 The bag also has a lace tie which can be used to secure the tote a bit, or tucked inside when not in use. It is lined in a tiny white on white fabric with generous pockets running the width of the bag and divided in half for convenience and organization. It is smaller in size than my usual large totes and measures about 14 x 15. The straps are long enough to carry in hand or throw over the shoulder. It will be listed in my etsy shop very soon. 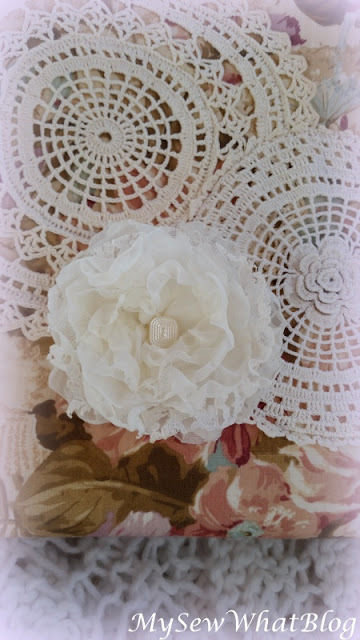 Though I am way behind in production for my ETSY shop, time has been well spent with my mom as she recovered in the hospital and now as she rehabs her way back home to us. Many thanks for your support during this time. It is very much appreciated.